I developped a new Rayman 1 patch. Similar to Rayman Optimum, but with its own interface and a long dreamed feature. 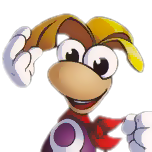 You'll need to supply your own legitimate copy of Rayman, be it either the original Rayman 1 CDs or GOG's release/UbiSofts Rayman Collection bundle. The main supported games are Rayman 1, Rayman Designer, Rayman by his Fans and Rayman 60 Levels, I hope I'll be able to make the educational games being supported too in the future. The main new feature of this software is the Per Level Soundtrack module (or TPLS how I call it) for Rayman 1. This little module replaces the entire soundtrack with the PS1 version's soundtrack order and adds few more wanted features. The way it works is as follows: Once downloaded and executed, you'll have to install it. Make sure to provide one or more of the previously mentioned main games. If you weren't able to provide all of the games, you'll still be able to install one game afterwards. The game that wasn't installed will stay greyed out. Once you're in main menu, you can change between two tabs: The main games list tab and the configuration tab. At the main games list tab, you can either install the missing game or launch the games you have already installed. Is the game lagging enter your GPUs settings and turn on adaptive vsync. In advanced options have the VSync mode to "Host" checked and make sure the VSync rate matches your monitor's refresh rate. If you encounter a problem dont hesitate to post in this thread or dm me. Special thanks to Haruka and my IT prof! And a big thanks to Adsolution and RibShark, who have been directly involved with this project! - Static pointer found. No more searching Rayman's base address! Last edited by Snagglebee on Sat Oct 20, 2018 8:28 pm, edited 13 times in total. Nice! But does it need to be run as admin? PluMGMK wrote: Nice! But does it need to be run as admin? Looking forward for the first release. And it's up Merry early christmas! Awesome! Well done to everyone who worked on this, it's really appreciated! I got it working on my Windows 10, although I had to attempt the installation twice. The installer crashed after copying the Rayman 1 files the first time for some reason. I had switched away from it to do something else, while the second time I left it in focus the whole time. System.IO.FileNotFoundException: Could not load file or assembly 'MetroFramework, Version=1.2.0.3, Culture=neutral, PublicKeyToken=5f91a84759bf584a' or one of its dependencies. Which to me suggests that it won't work on Windows 7, at least not out of the box. I had no issues to install it in my Windows 7, and I used the ISO I ripped of my Rayman Collector retail copy. Oh, okay. I'm not sure how the whole .NET ecosystem works these days! Sounds more of an issue with Wine unable to load embedded dependencies.... I tested it on a VM with Windows 7 and it was working fine, as long as I had the .NET Framework v4.51 installed. PluMGMK wrote: although I had to attempt the installation twice. The installer crashed after copying the Rayman 1 files the first time for some reason. I had switched away from it to do something else, while the second time I left it in focus the whole time. Could you further on explain what kind of crash you saw? Did the main install window just suddenly disappear? Did it give out an exception error? Did you check the Error.log under the installation path of Rayman Plus? Okay, sorry, the first post made it sound like you hadn't tested 7 at all. I wasn't expecting it to work on Wine anyway. I think there was an exception, causing me to get a window with a "Debug" option. I'm afraid I ignored what it said in favour of taking the "Einsteinian-insanity" approach to solving the problem, which actually worked. Sorry about that. There is a weirdness that causes the tracks to play in "double" that makes the music sound louder, sound like reverb or just outright out of phase. This is for every level that is played. Also, is it possible to add music in the loading screens? Just to say again, having played through the game, that this is fantastic! I noticed that it just lets the normal music play during the Skops fight. Ostensibly that's okay, but it means that (unlike in other levels) the music doesn't stop when Rayman dies, which is sub-optimal. - At "Free the protons and defeat Mr. Dark" change "protons" to "Electoons"
- Detect what language is being installed; set GUI lang-set accordingly! - Fix Midi stops playing after first loop! - Fix BGM stops 1 second after Rayman enters Level after going back to main menu and reenter Level. If you have more suggestions to what should be added, changed or fix please let me know, thanks! The timing's still terribly off, it's still wip. is there a way to disable the victory music? I’d rather it play the map music, like it does on the Saturn version. Is there any way to get an xbox one controller to work with this? It works on the unmodified Uplay version which uses dosbox but it seems to say no controller detected using this mod. The mod clearly makes the game much better though so I assume it's to do with xinput and Ubisoft somehow had it adapted into the game. I don't know if it's even legal for them to do that. DOSBox is GPL software, but they're DRM-ing it, right?